This attractive, long, low-slung home sits on the shores of Lake Brunner. Nestled into the landscape, the home takes its design and neutral colour cues from the serene lakeside surrounds – calm, contemplative and grounded in nature. The client wanted an informal holiday home that encouraged relaxation and quiet - a restful haven to retreat to that contrasted with their everyday lives in central Christchurch. 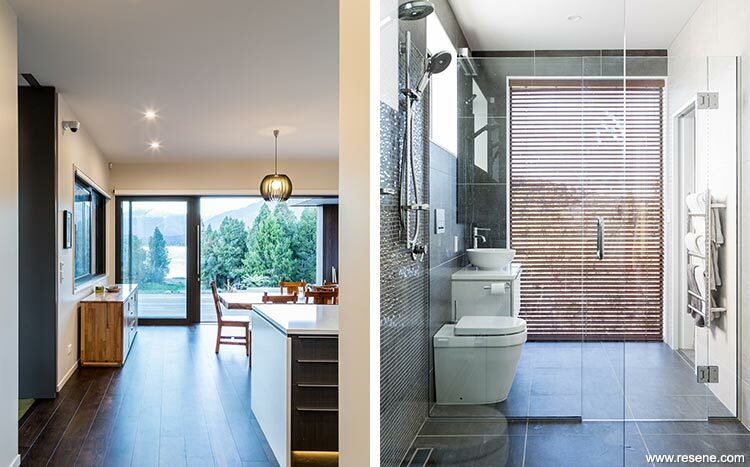 The front of the dark chocolate coloured cedar home completely opens up to receive stunning panoramic views of the lake. The whites and neutrals colour scheme is geared around enveloping the fluctuating views and letting them in to the home rather than wrestling them for dominance. At the heart of the design and colour scheme is the client’s desire for calm tranquillity. Large, sheltered outdoor living areas mean the house is enjoyed regardless of whether it’s wet or dry outside; and too much sun is never an issue with outdoor relaxation and entertaining areas with overhead shade. By positioning the external decks at the same height as the interior of the home it encourages a strong sense of connection and smooth transition between outside and the large lounge and living areas. The exterior is finished in Resene X-200 tinted to Resene Half Napa, over a base of Rockcote and Resene Limelock, with this colour continuing onto the soffits with Resene Lumbersider low sheen waterborne paint. The large lounge door and entry door are Resene Half Ironsand. Interior rooms are accessed via a wide, light, bright internal corridor which is grounded in place with a chocolate brown wooden floor, also creating a harmony and connection with the exterior wood colour. The corridor connects the lake-side of the home with two more bedrooms, the kitchen, dining-room and laundry. Here, the neutral white walls of Resene Akaroa in Resene Zylone Sheen are relieved with a white slatted timber treatment which screens the second lounge/TV room and provides contrast and texture. Ceilings and trim throughout are Resene Half Merino, using Resene SpaceCote Flat for the bathroom ceilings, Resene Ceiling Paint for living areas and Resene Lustacryl semi-gloss waterborne enamel on doors and trim. In the master suite, a floor-to-ceiling clear glass wall means enjoyment of the view continues from both the twin showers. A wooden privacy screen repeats the slatted wood motif used elsewhere in the home. Inspiration for the cohesive and understated colour scheme comes from the environment of Lake Brunner itself. The client’s desire was for a home that complements its beautiful surrounds rather than trying to compete with them. Warm, earthy tones; natural timber accents and using neutral colours let the design features and bespoke furniture shine through, and enable the view outside be enjoyed with no distraction. Harmony characterises this beautiful home’s colour experience. Muted neutrals echo the rocks, clouds, the shale shoreline and birds in flight. The neutral paint colours lighten the home and provide a strong reflective contrast and complement to the warmer wood tones. Echoes of the timber of the surrounding bush and forest can be found in the Resene paint colours that mean the home truly inhabits its environment. By using a Resene neutral on the external soffits, the striking dark timber exterior – a definitive signature of the design and the finished experience of both looking at and inhabiting the home - was set off to its fullest potential – fully realising the architect’s and client’s vision. The design and colour scheme surpassed the owner’s expectations, delivering more than they had hoped for. The couple often go for the weekend and find themselves staying longer as they are lulled by the calm surrounds achieved through careful use of neutral colours.